The book has been written for the first year bachelor of engineering (BE) and bachelor of technology (BTech) students of engineering colleges/universities majoring in various disciplines. Especially, the book has been developed as per the revised course content of Anna University (India), which is common to all engineering branches in the university as well as in all major national and international universities. 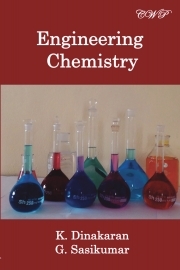 The book is a valuable resource for students to acquire knowledge and understanding about the basics and applications of chemistry in engineering and technology. It includes diagrams, abundant data and solved problems to reinforce the concepts. A question bank is also included at the end of the book for the benefit of the students. Dr. K. Dinakaran is a faculty member in the Department of Chemistry, Thiruvalluvar University, Vellore, India. He received his masters degree from University of Madras in 1996 and earned doctorate from Anna University in 2002. He has extensive teaching experience in engineering chemistry as well as organic chemistry at Anna University and Thiruvalluvar University. He has published 55 peer-reviewed research articles in reputed journals and 4 book chapters in the field of polymers and nano-chemistry. He has delivered invited talks in national and international conferences. He has accomplished many research projects funded by DRDO, CSIR, UGC & DST-SERB and has been guiding M.Phil. and Ph.D. students. Mr. G. Sasikumar received his masters degree in chemistry from Thiruvalluvar University, Vellore, India. He has more than 5 years of experience in teaching chemistry to undergraduate as well as postgraduate students.